You can create minisites with free software (Ill show you the best software to use). Over the past year Ive been using a style of minisite that works great. But whats even better - its very easy to create, and apart from typing the text, the whole website can be put together in under half an hour. Now - Ive put together a series of coaching videos that show you every single step in my minisite system. And - it doesnt matter if youve never created a web page before, Ill show you every single step from scratch - AND - using entirely free software. In this video Ill talk you through exactly what a minisite is and examples of successful minisite designs. Here Ill show you where to get the best 100% free web page creator. 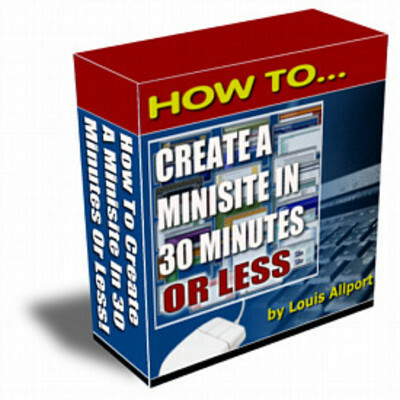 In this video Ill talk you step-by-step exactly how to easily create your first minisite. Here Ill show you how to expand on your single page website to turn it into an easy to use and very effective multi-page minisite. In this video Ill talk you through advanced formatting options and how to easily apply them to your minisites. Here Ill talk you through how to take a minisite for a resale rights product (a product you have the right to sell - like this one) and easily customize it with your own details so you can quickly be up and running and making sales. In this video Ill talk you through how to use FrontPage to create minisites. Now, FrontPage isnt free of course, but if you have the software installed on your computer, youll find this video a great primer to using it successfully for creating minisites. Here Ill talk you through how to use DreamWeaver to create your own minisites. Now - DreamWeaver isnt cheap and is really designed for professional web designers, but if youre interested in learning this software youll find this video a great introduction. In this video Ill show you how small changes to your minisite pages can help bring you a lot of free search engine traffic. Here Ill show you how to instantly check that every link on your website is working as it should. Youll find this tip a real time saver. In this video Ill show you where to get software 100% for free that allows you to copy your web pages on to the internet. Here Ill talk you through step-by-step exactly how to get your web pages from your computer to your website. This process is known as FTP, and can be very confusing if youre new to it. However, Ill talk you through every single step to help you find the process quick and easy. In this video Ill talk you through how to get your own unique address on the web, and how to get it live and ready to receive visitors. Here Ill show you how to quickly and easily create ClickBank and PayPal order links so you can be up, running and taking orders from your minisite instantly. Now - this eBook is brand new. Get a copy now, start promoting it immediately and youll make the most profits. Wait a day or a week or a month, and literally more and more profits will pass you by. Now, Im certainly not saying this to brag, but I wrote this sales copy, and my copy has sold hundreds of thousands of dollars worth of products online, if not millions of dollars worth. AND - from very affordable eBooks like this one. 30 Minutes Minisite. create minisite;minisite creator 131947954 3.00 gracenicholas Fresh Download Available!